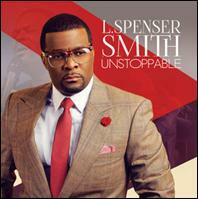 PR — Tuscaloosa, AL — Singer, Songwriter, Author and Pastor L. SPENSER SMITH has made a triumphant return to gospel music. After a near ten year musical hiatus, the Alabama based visionary released his solo debut CD UNSTOPPABLE that landed on the Billboard Top Gospel Chart this week at #4. Smith mixes a bit of neo-soul and funk in with powerfully passionate worship tracks and contemporary Gospel praise on the live worship experience. The 13-track project features “Show Us You” written by Grammy? Award Winning singer/songwriter Tasha Cobbs, title track “Unstoppable” written by Jason Nelson, Daniel Johnson and Smith, and hit radio single “My Life” written by Justin Francis and Smith. L. Spenser Smith is the Pastor of Impact Nation Fellowship Church with locations in Tuscaloosa and Birmingham, AL. He is the author of Getting Ready For Love, a book in which Smith gives scriptural and personal insights on the proper order of love -Loving God, Loving Ourselves, and Loving Others. For more information about the music, ministry and unstoppable world of L. Spenser Smith, visit www.LSpenserSmith.com.